1974 - Started riding Trials. 1977 - Brought his son Mike into the sport at age 5. 1985 - Took his son, former TI Champ class champion Mike, to his first National Trials event at age 13. 1990-1992 - TI NATC Rep.
1991 - TI Sportsman of the Year. This was for his work and coordination of the Berea, KY National. 1992 - Became the NATC awards coordinator, a position he held until 2015. If you have received a National award, chances are Jerry was responsible. In the early 90's, Jerry became one of the first members at Saddleback East, he helped move the Dixie Cup event from Berea, Ky to Saddleback, where it is still an active event to this day. He always had a bit of bad luck with the weather starting in 1991 in Berea and it followed him to Saddleback. With this bad luck also came with a nickname of "Rain Man", that Jerry wore proudly under his rain coat for many years. 1997 - Jerry handed the Dixie Cup off to Brad Baumert. 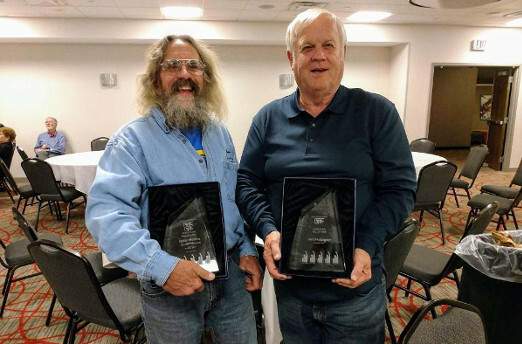 2015 - Jerry was inducted in to the NATC Hall of Fame. Since then he has remained active in the Trials community and enjoys Dual Sport riding in Moab, UT with friends he has made through his years of Trials and Motorcycle in general. Steve started riding trails with TI in the 1970's. 2001 to 2006: Competitor in the SENIOR A class. 2006 to 2008: Competitor in the SPORTSMAN class. 2008 to Present: Competitor in the SENIOR A class. As of his induction time (2017), he is the second highest of all T.I. Members for most competitions finished at 203. 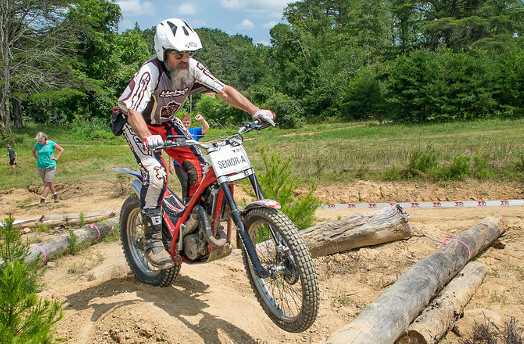 He has rode Vintage motorcycles back to when they were modern, and has rode countless "Now Vintage Events". Steve has been Section Captain at more than a couple World Rounds, and has scored many U.S. National events including the popular "Pro Shoot Outs". He has been an Area Rep. since before records were kept. He has been on the T.I. Hall of Fame Committee since its inception. He has also been in charge of Tech inspection at AMA Vintage Days. All this experience has made him one of the best Area Reps, Trials Master, and for sure, he delivers the best "Riders Meeting" hands down. The Pacific Coast Hwy for the entire length of Oregon, the Redwood Forrest of northern California and parts of Wa. State. Bryce Canyon in Utah, along with most of the State of Colorado, Steve has rode the "Highest Paved Road in North America" Mount Evans 14,271 ft. and Pikes Peak on Motorcycles. There is a rumor that he rode his Trials bike to the top of Mt Antero, 14,276 ft., clearly Steve enjoys getting high in Colorado! He rode his first Ute Cup in 2012 and was the oldest competitor to enter ...and did not finish last. He has finished 3 Ute cup events now, and Jerry Young has inspired him to keep riding them up to age 77. To say that Trials Incorporated would not be the same with out Steve Williams is an understatement!